Under the guidance of new label Wolf Tone and legendary producer Paul Epworth (who’s worked with Adele and Friendly Fires amongs other high-profile artists), the Oxford quartet have produced a debut album with such a broad sonic palette it’s difficult not to completely lose yourself in it. Just a small disclaimer before you do so though: run this through big speakers or decent headphones – it’s necessary if you want to experience the full effect of their considered arrangements. But, first things first, it’s important to note that the album’s title is derived from William Steig’s fantastical novel The Zabajaba Jungle where a boy embarks on a dreamy adventure through a vividly imagined jungle full of fantastical creatures and visceral vegetation. It’s definitely worth a read if you’re looking for ethereal escapism. If you can’t read, Zaba does a spectacular job of crafting a similar environment to get lost in. It opens with ‘Flip’ where mellow textures set the mood and provide a foundation for the track to build from as it swells uncontrollably. ‘Black Mambo’ however takes you somewhere more serene where treble-filled tinkles rattle around in a more barren soundscape. But lead single ‘Pools’ encapsulates the philosophy surrounding the album best. Tribal drums provide an earthy spine while woozy synths and gauzy guitars add gloss. And beneath Dave Bayley’s breathy vocals, you’ll find brittle critters scuttling along the forest floor with vitality. 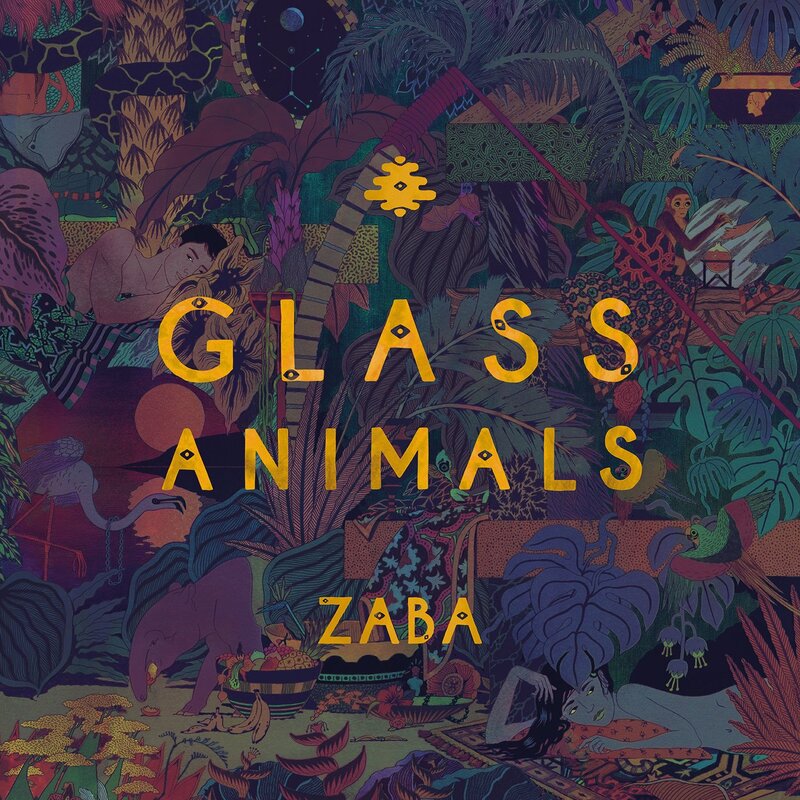 As you traverse farther into the dense jungle, you realise that Glass Animals aren’t just another new band with promise. Their appreciation for texture and timbre is not only lustfully executed but arranged with a sleek balance that ensures every click and hum plays an important part of building a vibrant but believable soundscape. Sometimes, tracks can be accused to creating a world that’s too distant and intangible. Close your eyes with Zaba coursing through your ears though and you’ll feel as if you can touch every layer and sense the life that it breathes. So when the ‘Intruxx’ breaks in with its limited vocals, you have all the space needed to admire the reverb-swathed layers as it leads into the second half of the album. ‘Hazey’ has a delicately judged blend of rumbling bass and glassy twinkles that seem to bounce off each other in symbiotic harmony. After finding yourself in the percussive density of ‘Wyrd’, their oldest track ‘Cocoa Hooves’ provides a welcome breather where instead of fighting impenetrable vegetation and busy insects, you can just float above the canopy in comfort. But the comfort is truly resolved in the tranquility of ‘JDNT’ where mellow vocals waft across warbling synths and that trademark twinkle that glistens in most of their tracks. You can stream Zaba on their interactive website right here.